I know that in recipes like this, the flavor of the tart comes from the type of chocolate you use, so you should really use a high quality chocolate, but I was busy and didn't have time to run to the store, so I just used what I had on hand - semisweet chocolate chips! I'm really not that picky when it comes to chocolate, so I have to say that the tart still came out pretty tasty using "inferior" chocolate, so I can only imagine how great it would be with good chocolate. I think blueberries would be nice to try in this tart too, but really you can't go wrong with the classic chocolate and raspberry combination. This recipe was really quick to throw together, especially since I already had some premade sweet tart dough in the freezer. It would make a great dessert for entertaining, since you could make the tart ahead of time and the chocolate filling only takes minutes to prepare. Thanks, Rachelle, for hosting this week. I loved it. The chocolate filling is really soft and creamy after it is baked and each bite that contains raspberry is a delight. If you would like the recipe, you can find it here. Make sure you check out the TWD Blogroll, to see how everyone else enjoyed this chocolatey treat! - I used semisweet chocolate chips in this recipe, mostly for convenience. - I would probably use more raspberries next time, as the bites I had that were without fruit just weren't as good. - I found that the baking time was much longer for my mini tarts, maybe because they were higher/thicker than one large tart? Not sure but mine took an extra 15 minutes to bake up. Just watch the tarts as they bake and you will see the top of the chocolate layer change in consistency. It will start to change from the outside edges of the tart and move inward, so once that appearance is uniform throughout the tart, you'll know it's done. I agree, chocolate and raspberries were meant for each other. This looks amazing and I so want a piece! Thanks! Looks heavenly. I haven't made this yet, but I still have 15 hrs of Tuesday left. I did chocolate chips too! I tend to save the good chocolate for the white stuff since white chocolate seems to be more finicky for me. My taste testers agree with you about upping the amount of raspberries next time. Glad you and Hubs enjoyed it! i like that you put inferior in quotation marks--chocolate is chocolate to me, and chocolate is delicious. i also think blueberries would be an excellent fruit to use. great stuff, jaime! I love the fork picture. I'll need to try it with raspberries the next time I make this. YUM. Way to go! Looks wonderful! Yum, this would be a fabulous birthday treat Jaime! I skipped the raspberries because they were too expensive but I'm definitely going to revisit this recipe this summer because, like you said, chocolate and raspberries are a perfect pair! I used bittersweet and semi-sweet. Yours looks like it turned out great! This was so yummy! 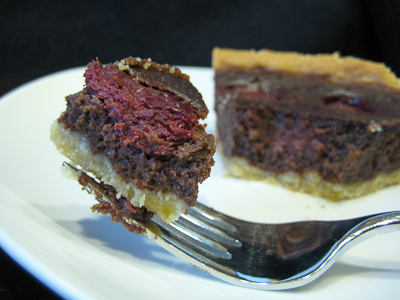 I love the colors of your tart - the reddish hue of the raspberry against the chocolate backdrop. Very nicely done! And your carrot cake looks delicious too. Great job!! Glad you liked the tart so much. I went with pistachios instead of raspberries, but really want to try it sometime with the raspberries because everyone's look so good. Ooh glad you liked it, chocolate and raspberry go so well together, yumm! Nom Nom Nom, this is definitely the right flavor combination! This looks like a great dessert. Thanks for sharing your talent and some great links.